12 wins & 46 nominations. "Certain Women" (2016 release; 107 min.) brings several stories about ordinary women in a remote community in Montana. As the movie opens, we get to know Laura Wells, a lawyer who just had a quickie with her lover over lunch time ("I had a meeting", she says to her assistant upon getting back to the office). Waiting for Laura is a disgruntled client, who feels he's been cheated out of an injury settlement he feels he's entitled to. An exasperated Laura decides to take him to another lawyer for a second opinion. At this point we're 10 min. into the movie but to tell you more of the plot would spoil your viewing experience, you'll just have to see for yourself how it all plays out. Couple of comments: this is the latest movie from writer-director-editor Kelly Reichardt, the acclaimed indie movie director who previously brought us "Wendy & Lucy" and "Meek's Cutoff" (both starring Michelle Williams, who returns here as well). The movie brings three basically unrelated stories (based on Maile Meloy's collection "Both Ways Is the Only Way I Want It"), and they all involve very ordinary people and ordinary lives that are shook up in one way or another (I'm biting my lips here, but won't spoil anything). The first story stars Laura Dern as the lawyer and Jared Harris as the disgruntled client; the second story stars Michelle Williams as the wife/mother in a strained marriage. The best, though, is saved for last, when we watch with fascination (and heartbreak) what unfolds between Kristen Stewart (as the Livingston, MT lawyer teaching a school law class in faraway Belfry, MT) and Lily Gladsone (as the lonesome horse rancher attending the class). I cannot recall seeing Kristen Stewart being more authentic in any previous role, even as compared to her roles in, say, "On the Road" or "The Runaways". Another major plus for the movie is that Reichardt lets a scene develop. Certain camera shots seemingly last forever. I don't mean to be snobby, but one of the reviews posted here gives this movie the lowest possible rating and compares it to 'watching paint dry'. I feel rather sorry for that person that he or she cannot appreciate a high quality movie like "Certain Women" (it is not a coincidence that this is rated 96% fresh on Rotten Tomatoes). 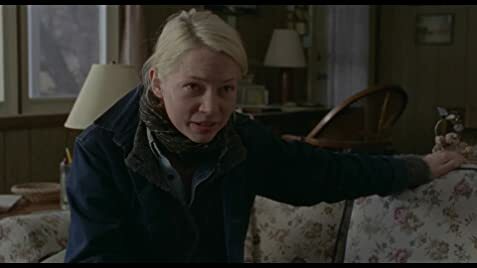 "Certain Women" premiered at the Sundance film festival earlier this year to great acclaim, and finally opened this past weekend at my local art-house theater here in Cincinnati. The Tuesday evening screening where I saw this at was attended very nicely, and you could hear a pin drop during much of the movie, as the audience seemed glued to their seat and the big screen. If you are in the mood for a top-notch indie movie with several great character studies and correlating outstanding acting performances, you cannot go wrong with this. "Certain Women" is HIGHLY RECOMMENDED! James Le Gros previously co-starred in Reichardt's Night Moves (2013). Gina: Thanks for helping out. Guthrie: No one asked me. Gina: No one asked me either. I just kinda figured it out all by myself. When Elizabeth Travis first starts her school law course, she begins writing her name as "Eliz..." on the blackboard, then wipes it out and simply writes "Beth". A little later a fully written but crossed out "Elizabeth" appears next to the "Beth".